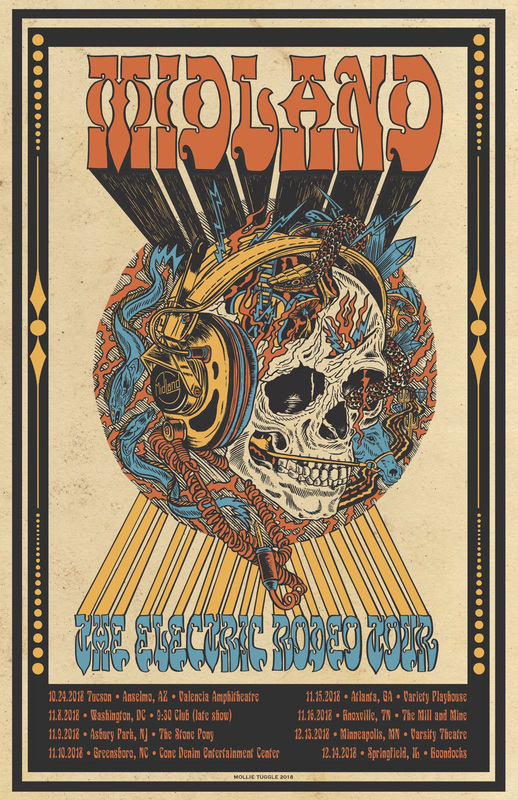 Midland is heading out this Fall on the Electric Rodeo Tour, which will kick off Oct. 24 in Tucson, Arizona. The limited run of headline dates will take the trio to Washington D.C., New Jersey, Atlanta, and several more cities through Dec. 14. The new tour comes on the heels of recent performances by the group at Billy Bob’s in Ft. Worth, Texas, and Bonnaroo, as well as their stint on Thomas Rhett’s Life Changes Tour. Tickets for the Electric Rodeo Tour go on sale Friday, June 22, and Spotify fans in participating markets will receive a special pre-sale code via email on Wednesday, June 20 to get early access to tickets. Fans signed up for Midland’s mailing list will also be emailed a promo code on Wednesday morning. Oct. 24 / Valencia Amphitheater / Tucson, Ariz.
Nov. 8 / 9:30 Club / Washington, D.C.
Nov. 9 / The Stone Pony / Asbury Park, N.J.
Nov. 10 / Cone Denim Entertainment Center / Greensboro, N.C.
Nov. 16 / The Mill and Mine / Knoxville, Tenn.
Dec. 14 / Boondocks / Springfield, Ill.